WINTERVILLE—For the seventh consecutive year, Pitt Community College celebrated civil rights pioneer Martin Luther King Jr.’s fight for social justice and equality with an on-campus fundraiser to benefit student scholarships. Held Thursday morning in the Craig F. Goess Student Center, a capacity crowd filled the facility’s Davenport Multipurpose Room to hear from Dr. Paul R. Cunningham, the program’s keynote speaker, and witness a pair of scholarship presentations by the PCC Multicultural Activities Committee (MAC), which organized the event. It was a scene much different from PCC’s inaugural MLK breakfast in 2013, which featured Rev. Sidney Locks, former pastor of Greenville’s Cornerstone Missionary Baptist Church, speaking to an audience of approximately 40. During his remarks on behalf of the City of Greenville, Mayor P.J. Connelly, one of several local legislators in attendance, noted that Pitt’s MLK tribute has become “a special event,” not just for the college but the entire community. Jasmin Spain, PCC Assistant Vice President of Student Development Services, said support from the community and PCC employees is the reason the tribute has steadily grown. Spain said well over 100 tickets were sold for this year’s MLK celebration and added that proceeds from the event would fund future MAC scholarships for students who possess a unique perspective on the importance of multiculturalism and acceptance. 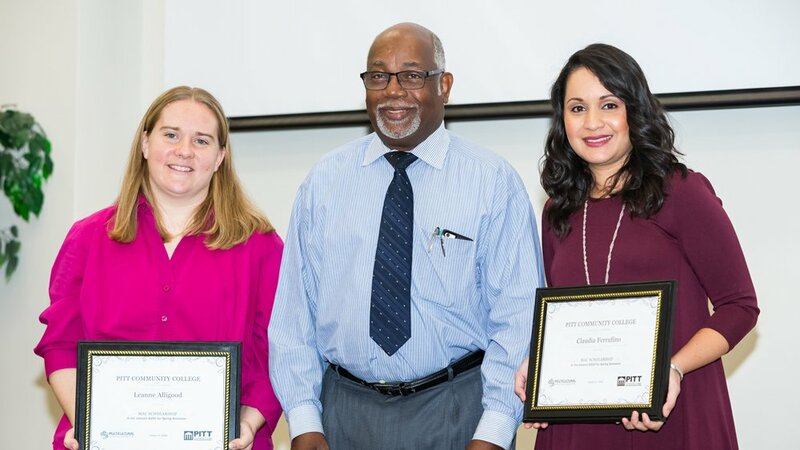 This year’s scholarship recipients were Claudia Ferrufino, who is pursuing associate degrees in Healthcare Management Technology and Medical Coding and Billing, and Leanne Alligood, a part-time student taking Health Information Technology (HIT) courses through distance learning. Ferrufino, a Honduras native who moved to America with her husband 11 years ago, received a $500-scholarship to help offset the cost of her educational expenses. “Claudia impressed the interview committee with her ability to face challenges head on, her belief that she has found her life’s purpose, and her desire to help others,” Spain said. Ferrufino first came to PCC for English as a Second Language courses. In addition to meeting new people and gaining new cultural insight, she learned how to speak English and is now working as a medical interpreter as she furthers her education at Pitt. As this year’s second-place finisher, Alligood received $250 through her scholarship. A stay-at-home mother of five children with husband, Chris, she needed a program that allowed her to pursue an education and take care of her family at the same time. She found it in PCC’s online HIT program. Alligood is planning to work from home once she completes her HIT training. And when her children are older, she hopes to pursue a nursing degree. Both scholarships were presented in memory of Dr. Andrew A. Best, a physician who shared King’s ideals as he practiced medicine in Greenville for 50 years while also serving in various leadership roles locally and at the state level. Prior to the scholarship presentations, Dr. Julius Mallette, a former colleague of Best, shared thoughts on his friend, who passed away in 2005. Best was the first African-American member of the East Carolina University (ECU) Board of Trustees and one of the first African-Americans to serve on the University of North Carolina Board of Governors. He is credited with helping lead efforts to desegregate and change discriminatory policies at Pitt County Memorial Hospital (now Vidant Medical Center) and ECU. A native of Jamaica, Cunningham moved to Greenville in 1981 to practice medicine at Bertie Memorial Hospital and teach ECU medical students. A surgeon, he received numerous awards, published many research articles and eventually became dean of ECU’s Brody School of Medicine in 2008. He retired eight years later and received the Order of the Long Leaf Pine for his outstanding contributions to health care in North Carolina. With approximately 67 percent of PCC’s student population receiving some form of financial aid, Spain said the MAC Scholarship and others like it go a long way toward making a college education accessible to the entire community.